Adults and their tots will have fun exploring, discovering, and learning on the first Thursday of the month in the Museum’s Discovery Center. Spend quality time with your tot, while each of you makes new friends. A different topic and craft will be featured each month. Representatives from the Therkildsen Fieldstation at Emiquon will have water samples from Thompson Lake. 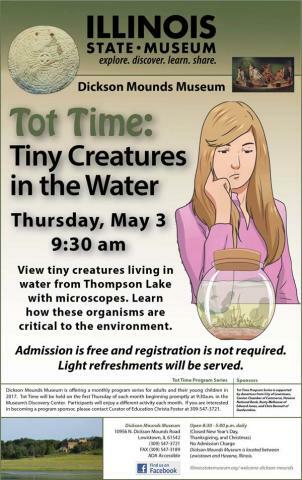 Participants may view the tiny creatures, living in this water, under microscopes and learn about how these organisms are critical to the local environment. Registration is not required and admission is free. Participants will enjoy light refreshments. The program begins promptly at 9:30 a.m. with the program portion lasting approximately thirty minutes followed by crafts, snacks, and time to explore the Museum. This program series is sponsored by the City of Lewistown, Canton Chamber of Commerce, Havana National Bank, Rusty Melhouse of Edward Jones, and Chris Bennett of Dunfermline.